The shovel hits and breaks the ground—the sound of it deafening as it turns over the red clay dirt. Repeatedly, she goes through the motions, her eyes stinging with the tears falling over her cheeks, the palms of her hands burning from the twist of the shovel. The young mother is small in frame, barely five feet tall, but she is determined. Finally, she lowers the boy she gave birth to into the shallow grave and again picks up the shovel to cover his lifeless body. Alone, she makes her way back to her village. It is not the first time Kusum has said goodbye to someone she loves. Her husband died from an illness five years before. Despite her Christian faith, the Hindu village in Central India where she lives allowed the young widow to give him a proper burial. Watch the video below to see Kusum share her story. Wrapped in an emerald green saree, a trim of fuschia framing her face, Kusum (a Hindu name meaning “flower”) shares her difficult yet quite beautiful story of tragedy and faithful perseverance. Kusum is one of an estimated 40 million widows (10 percent of all women) in India, though the majority is older, aging women. She is now 28. She is also one of 64 million Christians in the country of 1.3 billion who endures persecution for her faith. In her short lifetime, she has suffered more for her faith than most Christians have in their lifetime. For Kusum, persecution stems primarily from family and her local community. The challenges started early. Born into a Hindu family, she began going to church when she was 11 but because of her family’s devout Hinduism was forced to attend secretly. Later, her parents also wanted to become Christians, she says, and went with her to church. Sign up to get prayer updates about persecution in India and Christian Persecution around the world. As is the custom in most rural parts of India, Kusum married at a young age and had her first child, a son, at age 16. Her husband, a Hindu, forbade his Christian wife from going to church and practicing her faith. Still, Kusum prayed for him and made futile attempts to bring him to church. Four years later, their second son was born. Shortly after, at age 24, Kusum became a widow. Without him, the young widow and mother of two struggled to support their family. The villagers knew Kusum had tried to persuade him to go to church with her and blamed her for his death. For the next five years, Kusum struggled to earn money and feed her children. She hid her faith so she wouldn’t upset the Hindus too much, and they allowed her to earn some money for food and to draw water from the well. In summer 2015, tragedy struck again. Kusum’s five-year-old son was diagnosed with sickle cell anemia and hospitalized for a full month. “At first, I tried to hide my faith as much as possible,” she says, fearing even more discrimination. “Then I thought: Maybe God will heal my son if I don’t stay a secret believer, but be a more open witness. I will follow Him and God will heal my son. Her son recovered and returned home and for a few months was his playful self. She remembers the day he came to her not feeling well. “Let’s go to our friend, and we can pray for you,” she told him. But there was little to no improvement. They brought him to the nearest clinic where the nurse drew blood from his finger. “It was more like watery fluid,” Kusum remembers, her eyes gazing forward. Quickly, they rushed to the hospital. On their way there, Kusum says she felt her youngest son slip away. At 7 p.m. that night, her second-born child took his last breath. Kusum waited as her parents came to collect her and their grandson’s body. Almost immediately upon returning home, a new wave of persecution crashed on Kusum. Tragedy again became an open door for persecution. Suddenly, her focus shifts and she shares about the night her father-in-law showed up at her window shortly after she buried her son. Kusum had nowhere to run. She crouched in a corner, silently praying. Kusum may never know what went through her father-in-law’s mind that night. Was it only rage? Was it sadness, a sense of feeling powerless? In the end, he just walked away. The young widow and faithful follower of Christ is also a mother who has survived a parent’s worst nightmare—the loss of a child. Still, the void is unbearable. Unfortunately, Kusum’s village is still very hostile towards Christians. Nobody in her village talks to Kusum or the one other Christian family in it. Pray that more people around her would come to know Christ. Her parents must work 18 miles outside of their village. No one will hire them because of their Christian faith. Pray with Kusum, her son and her parents as they live as outcasts in the Hindu village. Kusum suffers from an illness and is physically too weak to find a job so far outside the village. She and her son live in their own house; her parents and siblings take turns staying with her, and her parents provide her with daily living necessities. And she is allowed to draw water from the well. Pray with Kusum for healing and strength as she raises her son. Ask God to help her provide for herself and her son. Pray for her son and ask God to guide his life–that he may grow up to trust Him in whatever circumstance. He misses his little brother. Ask God to comfort and protect him. 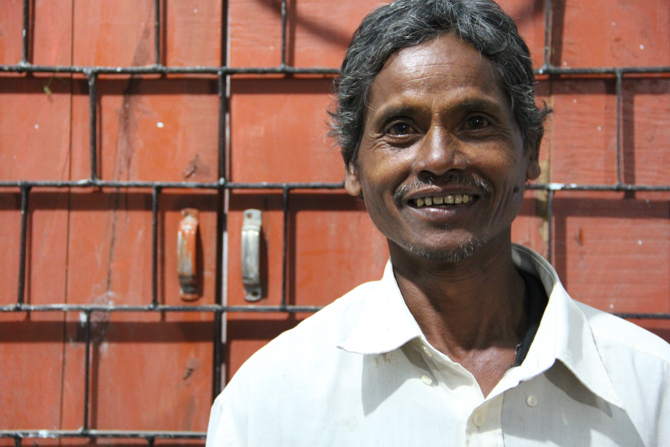 Kusum asks that we pray he will serve the Lord. Pray with the few Christians in the village who are not allowed to have a worship service in their own homes. Every Sunday, Kusum and the other Christians walk four miles to another church. Kusum remains faithful to the Lord. Since meeting Kusum and hearing her story, Open Doors has come alongside her and her son with support and encouragement. When Open Doors met with Kusum a second time, she shared how thankful she was for those who prayed for her. Volunteers comforted her, telling her that many people, especially women–some of them widows and mothers who have lost children–were earnestly praying for her.